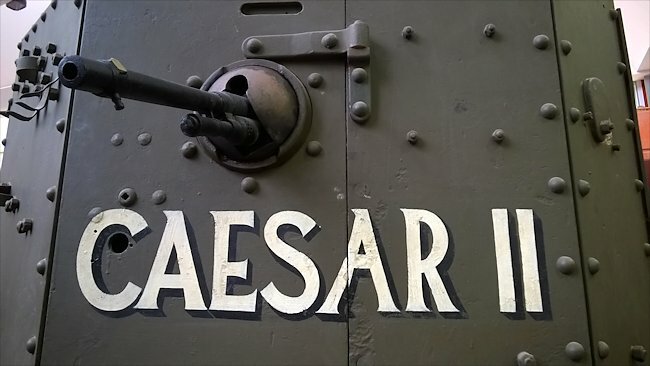 This WW1 British Mark A Whippet tank nicknamed 'Caesar II' can be found at the Tank Museum, Bovington, Dorest, BH20 6JG, England. Their website is tankmuseum.org. Lieutenant C.H. Sewell commanded this tank at Fremincourt in August 1918. He was posthumously awarded the Victoria Cross. It was named 'Caesar'. This Whippet, nicknamed 'Ceasar II' went into battle on 29th August 1918. Its commander Lieutenant Cecil Sewell saw some British Soldiers trapped in an over turned tank. He jumped out of his tank to rescue them. They were all saved but just as he was about to return to his tank he was shot dead. Sewell was awarded the highest military honour, the Victoria Cross, for his outstanding bravery. The Mk A Whippet was designed as a break-out not a break-through tank. After the initial success of the first British tank attacks during WW1 the Germans responded by making their trenches wider. 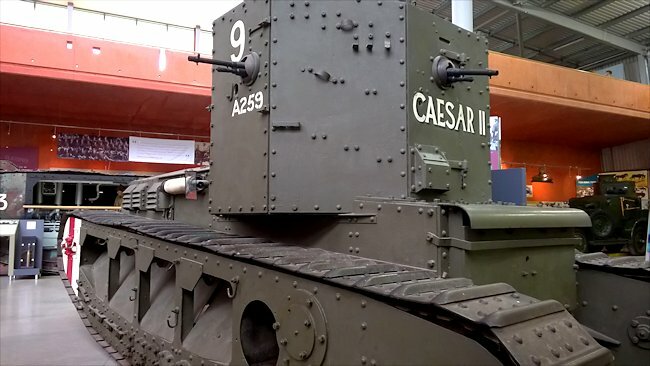 The British engineers made newer versions of some the tanks longer like the Mark V* tank and the Mark VIII tank. Others were fitted with equipment that helped them cross wider trenches, like the huge bundles of wood carried into battle, that were dropped into the trench to form a bridge that a tank could cross once enough had been unloaded. The other problem with the standard WW1 British and French tanks was that they were so slow. If the tanks had managed to breach the German defences they could not exploit their achievement with rapid movement as they could only manage a walking pace. A faster chaser tank that would fulfill the roll that the cavalry used to perform on the battlefield was needed. Sir William Tritton, an expert in agricultural machinery who had help develop the Mark I British Tank, foresaw this requirement. He submitted a proposal for a British ‘Chaser’ tank as early as December 1916. It was accepted and during 1917 the first 14 ton Medium Mark A Tank was developed and manufactured by William Foster and Co Ltd in Lincoln. It was powered by a two Taylor 4 cylinder 7.7 litre engine that produced 45 bhp each. Each engine had a separate clutch and gearbox to control just one track. It was difficult to drive. It was later to be called the Whippet because of its relatively high speed compared to the Mark V tanks. It could go at 8 mph (12.9 km/h) on the road compared to the slow 4mph (7.4km/h) of the Mark V tank. WW1 British Whippet Mark A Tank. Notice the mud shoots that run down from the top track to help keep the tracks unclogged. 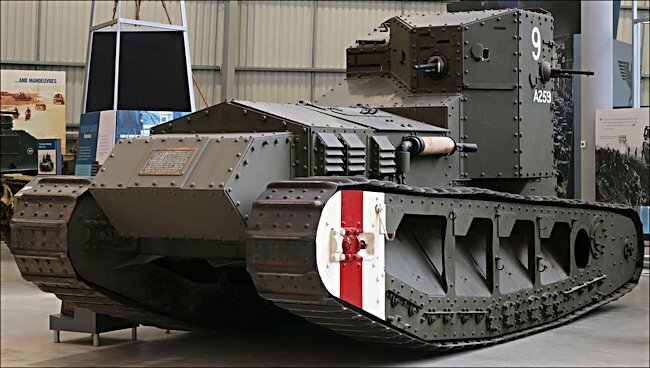 They were the first modern-looking tank the British made. It was driven by one man. It had low profile tracks to keep the weight down. The Whippet tanks engine and transmission was separate from the crew thus reducing the amount of fumes and the risk of fire. It had a fixed turret with four swiveling 0.303 Hotchkiss Mk1 Machine guns. 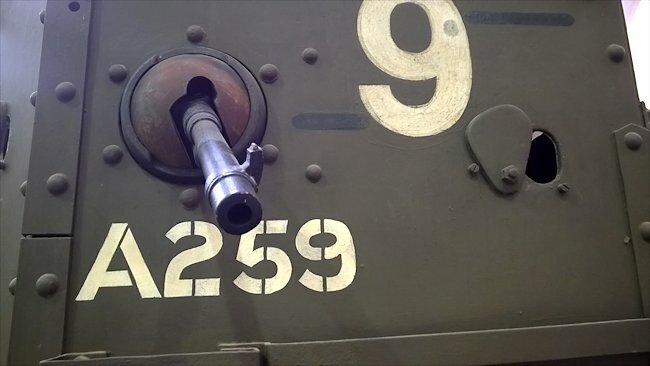 The crew had vision slots around the turret. False ones were painted onto the turret to fool the enemy into firing at them rather than the real ones. It only weighed 14.3 tonnes compared to the Mark V tanks 29 tonnes. It was slightly smaller in length being 20 feet long (6.10m), whereas the Mark V tank was 26ft 5in long (8.5m), but that was still adequate to cross most standard German trench systems. A tank that was designed to take advantage of a breach in the enemy’s static defences needed to be able to operate for a long time without having to return to base to be refuelled. The standard heavy British tanks only had a potential range of 45 miles (72km). The Mk A Whippet had a much longer range of 160miles (257km). The Mark A Whippet first saw combat in march 1918. It was used initially to plug gaps in the line as it could get their quicker than the heavy tanks. This was not what the tank had been designed for but it did the job well enough. It’s worth was proved when it was allowed to make deep forays behind German lines and create havoc. The first officially recorded German Panzer A7V vs Whippet tank battle occurred on the 24th April 1918. The Whippet was destroyed by cannon fire from the A7V. This was the second tank on tank battle during World War One. The Whippet was not designed to take on another tank. When it was conceived the British did not know the Germans were making a Heavy tank called the A7V. in another engagement it did not go well for the British when a seven Mark A Whippets, sent in to deal with German machine gun posts, suddenly drove into the path of advancing Panzer Gruppe A7V tanks. German panzer Leutnant Volckheim recalled with satisfaction, "Another German tank saw seven light British tanks coming and succeeded in hitting three, while the others quickly sought cover." The Whippets had no chance against these armoured monsters. Captain Price, the Whippet commanding officer, reported that the engagement happened so rapidly that they thought they had been engaged by a field gun so they retreated. He had not seen the German A7V heavy tanks. WW1 British Whippet Mark A Tanks also had pistol ports with a swivel armoured cover in the fixed turret next to the machine guns. Notice the black lines painted on the turret. These are false vision ports to attract enemy fire. During an assault on the Hindenburg Line, a Whippet tank commander, Major W.H.L. Watson reported the loss of some of his units tanks because of problems with the clutch slipping. This had the effect of stalling the tank and making it stationary. They then became easy targets for the German artillery. When this happened and the driver was unable to get the engine back into gear the only option was for the tank crew to abandon the vehicle and find cover in a trench or shell hole. The British 3rd Tank Brigade was issued with 96 Mark A Whippet Tanks which they divided between the 3rd Tank Battalion and the 6th Tank Battalion. Each Battalion had 48 which fought alongside Mark IV and V tanks. During the battle of Amiens on the 8th August 1918 the 3rd TB Mk A Whippets broke through the German Lines. They were finally able to operate doing the job they had been designed to do. One Whippet number 344 of 6th TB, named ‘Musical Box’ by its crew, famously drove so far into the enemy’s rear that it found itself cut off from friendly forces. It was commanded by Lt C.B.Arnold. The gunner was C.Ribbans and the driver was W.J.Carney. For nine hours it just went hunting for targets. These included destroying an Observation Balloon unit, an artillery battery, a transport supply column of the German 225th Division and the HQ camp of an infantry battalion they found between Bayonvillers and Harbonnieres. Musical Box caused heavy casualties with its mobile heavy machine guns. The crew had to wear gas masks to continue fighting their whippet when small arms fire ruptured spare cans of petrol carried on the roof of their tank. The petrol seeped into the crew compartment and the fumes were nauseating. If it caught fire they would all be burnt to death in an inferno. Knowing the risk they still kept on fighting until a German gun crew managed to hit their tank with a round that disabled it. As the crew abandoned their Whippet they came under fire. The driver W.J.Carney was shot dead and the other two were taken prisoner. The Germans were also producing a lighter cavalry tank called the LK II. It looked very similar to the Whippet and many historians have wrongly said it was a copy because it came out later. The German tank engineers had seen the same battlefield requirement and had started their own research and development program not knowing that the British were doing the same. The LK II entered production in October 1918 and only 10 were made before the end of the war. They were sold to Sweden. After the end of World War One the Mk A tank was used in Ireland and some were exported to Japan in the 1920s. The British Government supported the ‘White Russians’ in their fight against the Communist ‘Red Russians’ by sending them surplus WW1 British tanks. This included 17 Whippets, 12 of which were captured by the Reds and later put to use in their army. Where can I find other preserved Mark A Whippet Tanks?